Seeds can do a lot more than garnish dishes and add some crunch. These 8 delicious recipes creatively use seeds as the base of highly nutritious meals. You’re probably used to a sprinkle of seeds in your favorite recipes for stir fry, sauces, and baked goods, but you can get a lot more out of these nutrient-dense foods. 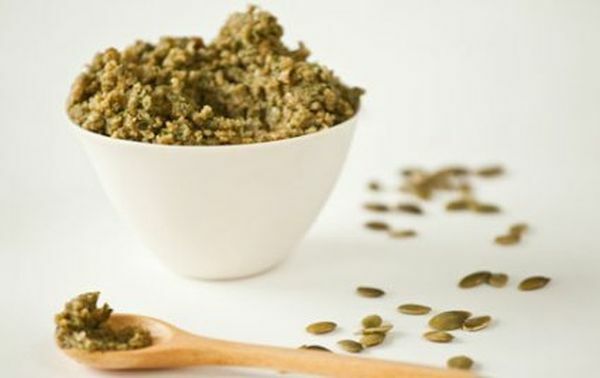 Not only are seeds nutritional powerhouses–the high amounts of calcium in chia seeds, iron in pepitas, and omega-3 fatty acids in flax, and complementary omega-6 fatty acids in sesame seeds, for example–they can be used to create a variety of delicious dishes. They’re also ideal pantry staples since they don’t take up much space and keep for several months before spoiling. Here are 8 healthy seed recipes to get you started. Enjoy! Tired of the having the same pasta sauce week after week? Whether you prefer ziti, angel hair pasta, or even gnocchi, this lively pesto will make dinnertime feel fresh again. 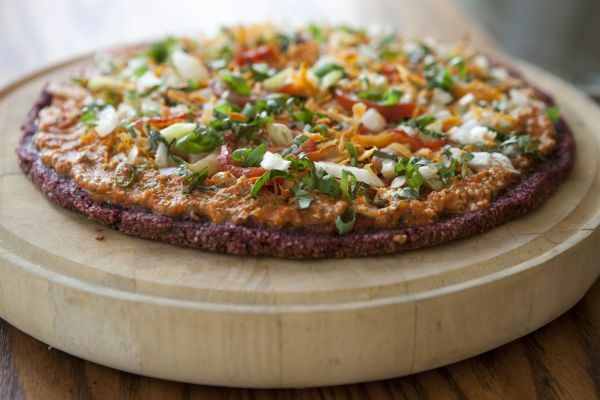 With cilantro and pepitas, it’s also a great base for a pizza topped with flavors inspired by the world over, such as spicy chicken tikka masala, lime-infused Thai beef, or sweet pork al pastor. 2. Toss pumpkin seeds with the salt and 2 tablespoons of oil. Spread out in a single layer on a large baking sheet. 3. Roast until seeds are puffed and fragrant, 10 to 15 minutes, stirring about halfway through. Set aside to cool. 4. Combine seeds in a food processor with water, lemon juice, garlic, cilantro, and remaining 4 tablespoons of oil. Pulse until mixture forms a coarse paste, and season with salt and pepper. Cover and chill until ready to use. Peanut butter is a classic ingredient found in most kitchens, but there are alternatives that have a milder taste and, depending on your dietary targets, a more desirable nutritional profile. 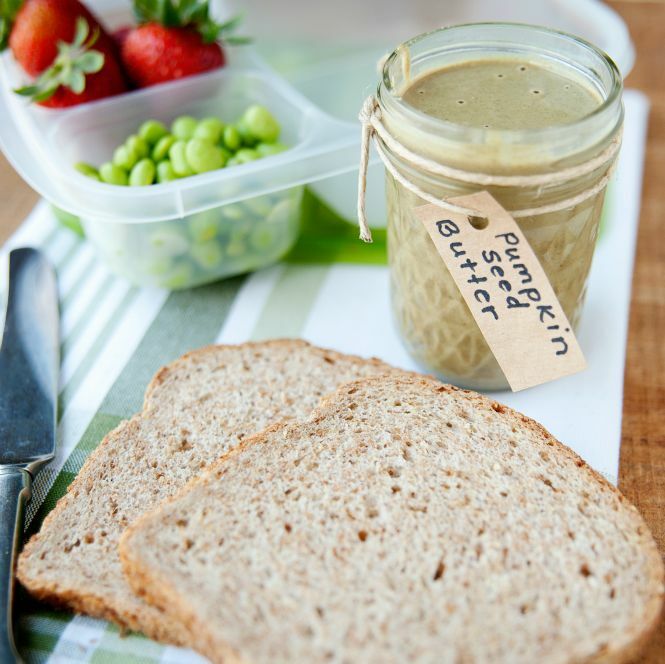 Almond butter as a replacement is a no-brainer for lower fat and a less pronounced flavor, but pumpkin seed butter is another great option. It tends to have a more spreadable consistency – along with healthy fats, minerals like magnesium and iron, and proteins including tryptophan, the same amino acid found in turkey that reduces stress and improves sleep patterns. 2. In a bowl, toss pumpkin seeds with cinnamon to evenly coat. 3. Place the pumpkin seeds on a cookie sheet, and bake for 15 minutes, or until golden brown. 5. Place the seeds in a food processor, and process into butter for several minutes, occasionally scraping down the sides with a spatula. 6. After the first minute or two, it will look like a giant ball, but keep going. Add pure maple syrup (sweetener is optional), and continue pureeing until it becomes smooth. Whether you’re looking for ways to cut carb intake, bake grain-free bread, or reap the benefits of flaxseed’s healthy fats without swallowing supplements, this unique focaccia recipe will be a hit. Although the texture resembles the classic Italian flatbread, the bread contains no flour. 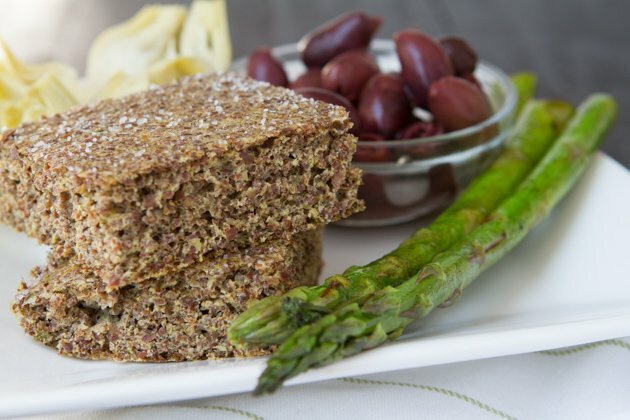 Ground flaxseed is instead mixed with eggs, oil, and herbs to make a low-carb bread that’s delicious alone or for sandwiches. 1. Preheat the oven to 350°F, and line a 9” x 13” pan with parchment paper draped over the sides. Set aside. 2. In a large bowl, combine flax, baking powder, herb mix, and sea salt. Whisk to combine fully, and set aside. 3. Add eggs, water, and oil to a high-powered blender. Blend on high for 30 seconds until foamy. 4. Transfer liquid mixture to the bowl with the flaxseed mixture. Stir with a spatula, until just incorporated. The mixture will be very fluffy. Allow to sit for 3 minutes. 5. Pour the mixture into prepared baking pan, and smooth with the back of the spatula. Set in the oven to bake for 20 minutes, until top is golden. 6. Remove from the oven, and use the paper flaps to lift the flax focaccia bread to a cooling rack. Peel the parchment paper from the bottom of the bread, and allow the bread to cool for an hour. 7. Cut into 12 pieces. Bread can be toasted or frozen. It’ll keep in the fridge for 3–4 days and in the freezer for up to 3 months. 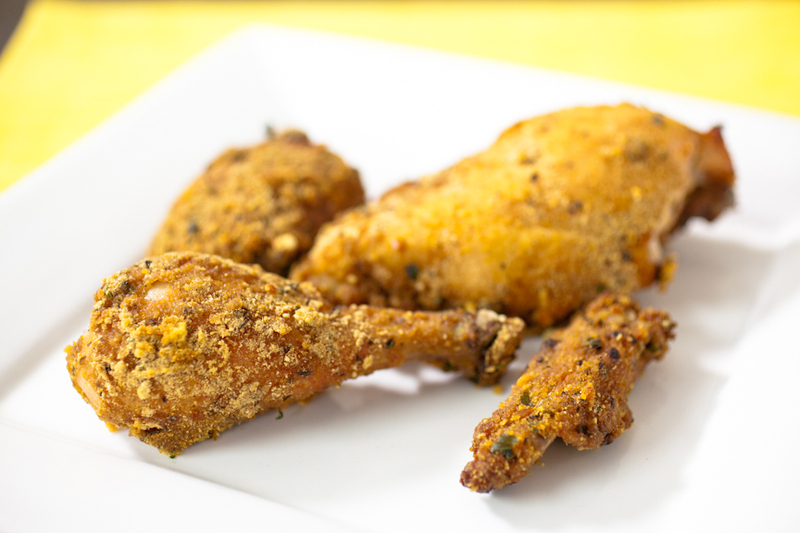 Fried chicken is an American comfort food for good reason: crispy skin, tender meat, and simple seasoning. But when it’s coated in oil, the protein from the chicken becomes a lot less nutritious. A batter of flaxseed and unsalted crackers, mixed with egg and skim milk, will give you a lot more bang for the buck. As the chicken bakes in the oven, it’s easy to prep a side dish of roast veggies at the same time. If you really want to recreate the fried experience without the added fat, check out this awesome air fryer. 1. Preheat the oven to 350°F. Grease a large baking pan. 2. In a small bowl, beat the egg, and then stir in the milk. 3. In a shallow container, combine ground flax, cracker crumbs, pepper, parsley, paprika, chili, garlic, and seasoned salt. 4. Skin the chicken, and rinse with water. Pat dry. 5. Dip skinless chicken into the egg mixture. Coat with the crumb mixture, and place on the greased baking pan so the pieces do not touch. 6. Drizzle the chicken with melted butter (optional), and bake for 45 minutes. Do not turn chicken pieces while cooking. Once done, the chicken will be tender and no longer pink. This recipe begins by toasting a mix of seeds: sunflower, white sesame, and black sesame. Then they’re turned into a sweet-savory sauce with Japanese soy sauce, sweet rice wine, and brown rice vinegar. A touch of red chili peppers and a big helping of fresh kale make this a noodle dish in which the soba is buried under good-for-you ingredients. 1. Toast the sunflower seeds and sesame seeds over medium heat in a dry pan, stirring frequently until fragrant, or about 5 minutes. 2. Pour toasted seeds into a food processor and pulse until gritty and sand-like. Add the sugar, shoyu, mirin, sesame oil, brown rice vinegar, chili powder and red pepper flakes. Pulse until blended. Scoop into a bowl or jar, and set aside. 3. Bring a large pot of salted water to a boil and add soba noodles. Cook according to package directions. 4. Meanwhile, preheat the oven to 350°F to crisp up the kale. 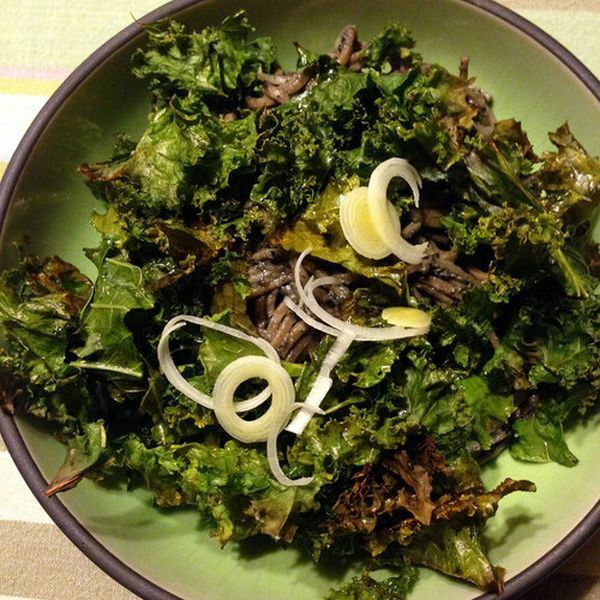 Toss very dry kale with about a tablespoon of sesame oil and a few pinches of sea salt. Bake for about 15 to 20 minutes until kale is crisp and its edges are just beginning to char. 5. Drain the pasta when finished, reserving about 1/3 cup of the noodle water. Rinse the noodles under cool water. 6. Add all but about one tablespoon of the sesame paste to the hot noodle water. Put noodles and about half of the sliced leeks in a large bowl and toss with the sesame-paste water mixture. If the paste seems clumpy, add a bit more water until it loosens into a sauce. 7. Serve hot with a dollop of sesame paste and a sprinkle of sliced leeks and crispy kale. This sauce is vegan, but forget about all that and focus on the creaminess created with this unique blend of cashews and hemp seeds. 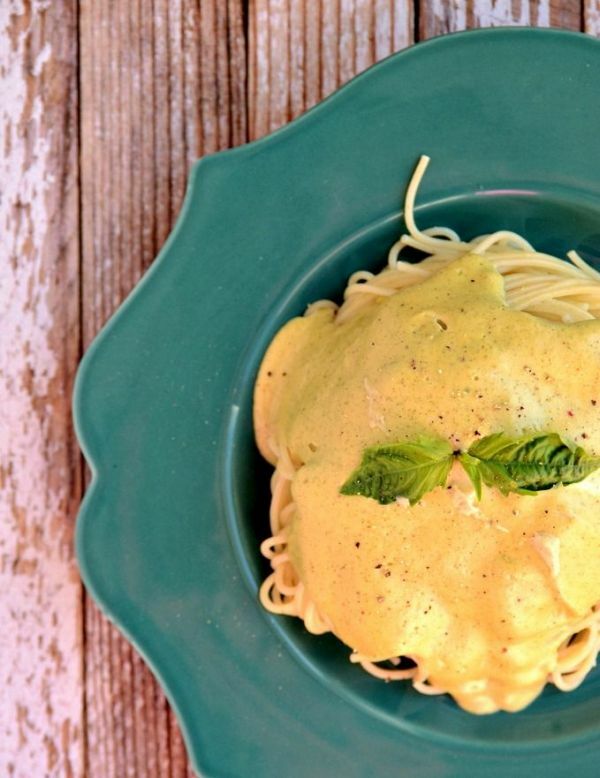 Dairy aside – yes, literally – there’s no way traditional alfredo can match the nutritional profile of this sauce. There’s plenty of protein, healthy fats, and complex carbs to make any dietician happy. And of course, there’s enough rich flavor and creamy texture to make you happy too. 1. Soak the cashews in warm water for at least 30 minutes to soften. Drain before using. 2. Add all ingredients to a high-powered blender, and run on high for 2 minutes. When finished, it’ll be super creamy and smooth. 3. Serve over your favorite pasta or veggies. Chia seeds – which get their name from the ancient Mayan word for “strength” – are becoming one of the most popular superfoods. Since they can absorb a bunch of water and get gummy, they’re often made into puddings or tossed into smoothies, and like all seeds, they’re also an easy way to add crunch to a salad. 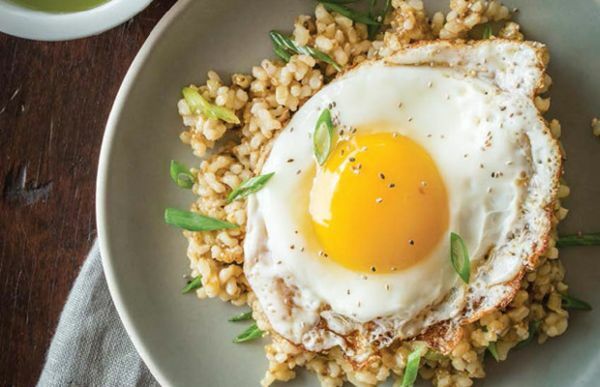 But because they are so excellent at binding, they also can make brown rice sticky, as well as adding fiber, calcium, omega-3 fatty acids, and many more nutrients. 2. Bring the chia-green onion gel to a boil over high heat. Add the rice, and stir for about 30 seconds. Cover, reduce heat to low, and cook until rice is steaming hot and has a sticky consistency. It’ll be ready in about 4 minutes. 3. Meanwhile, heat the oil in a nonstick skillet over medium heat. Add the eggs, and cook until desired doneness, such as sunny-side up, about 4 minutes. 4. Divide the sticky rice mixture onto plates or into bowls, and top each serving with an egg. Sprinkle with the tamari, the remaining 1/2 tsp. chia seeds, and the green parts of green onions. Serve immediately. Two-time Canadian 50k ultramarathon champion Brendan Braizer is known for formulating the Vega line of vegan products to help others fuel their activities the healthy way. 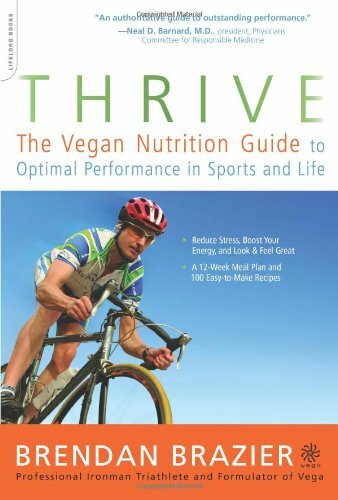 But no one can satisfy the needs of a healthy diet through supplemental drinks and convenience nutritional bars alone, and that’s why he’s also written cookbooks like Thrive: The Vegan Nutrition Guide to Optimal Performance in Sports and Life, making it easier to prepare fresh superfoods in your home kitchen. 1. In a food processor, combine garlic cloves, red bell peppers, half the fresh basil, nutritional yeast, hemp seeds, and 2 tablespoons of hemp oil, and salt to make the pesto. 2. Preheat the oven to 300°F. Lightly grease a baking tray with oil, and set aside. 3. Make the dough for the crust in a food processor. Mix together buckwheat groats, sunflower seeds, beets, 1/4 cup oil, parsley, and salt until a ball forms. 4. On the greased baking pan, spread dough about 1/4” thick. Spread the sweet pepper hemp pesto on the crust, and add the toppings. 5. Bake for about 45 minutes. The time will vary slightly depending on the moisture contents of the vegetables and desired crispness of the pizza. What did you think of these healthy seed recipes? Have anything else to share? Let me know in the comments below!